It started a little over a year ago. If you’re a regular reader to this blog or if you’ve gone through the posts filed under “Journey Toward Financial Peace,” then you know what our last year has been like. Early last January, my family was $900.00 in the hole. That looks like -$900.00 or ($900.00) or $900.00. However that appears on a ledger sheet, the bottom line is, there was a whoppin’ $900.00 missing from our usual income. We knew where it was, but that didn’t help matters much. It didn’t help us enjoy better food, nor did it help us pay all the bills. It also didn’t help me sleep better at night, because I was so worried and so anxious about our financial situation. Our home life was tense. Talking to my husband didn’t help, because he felt defensive, like he wasn’t doing enough (absolutely NOT the case), so I was left feeling alone in my anxiety. We needed to bring some peace into our home life. We’d both received money for Christmas, and I was thinking that a nice pair of clogs would make a great gift for myself. They were going on clearance, I’d shopped around online at my favorite online shoe store (since we don’t have one of their brick-and-mortar stores near where we live), and I was going to be able to score an $80.00 pair of shoes for $49.95. Woot! Then I saw in the hand-out for last year’s Life U classes at church that there was going to be a course called Financial Peace University. Registration required. I’d never heard of Dave Ramsey. I’d never heard of Financial Peace University. We were willing to try it, though. And after spending $50.00 on the course, we were willing to commit to sticking with it. The first thing we had to do was create a basic budget, just to see what we spent on our “four walls” (mortgage, utilities, groceries and transportation). That was easy enough. And then Dave started talking about the baby steps. Baby Step 1 is to set aside a basic emergency fund of $1000.00. *Gasp! * What??? How much!?!?! We were eating lots of beans and rice. 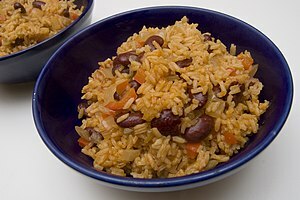 And when we got tired of beans and rice, we’d change it up to rice and beans. We didn’t have an extra $20.00, let alone $1000.00! Damnit, though! We still weren’t going to give up! Some way, some how, we were going to get that $1000.00! There are two things I remember from this time. One, for the first time in ages, I had hope that things were going to get better, because I felt like we were in charge of our money. Once we took charge of our money, we could control where it went (instead of wondering where it’d gone). Two, I felt grateful. You may be wondering, “How could you feel grateful when you were beyond broke and eating beans and rice?” I felt grateful, because there was food on our table and my family was around it. We had food on our table in the dinette in our home, and we ate it together as a family. When so many people have lost homes and families and are starving, we were practically living like royalty by comparison. There’s much more to this story to share, but I’m breaking it into parts to make for easier reading. Stay tuned! You may also want to follow this blog and/or subscribe to the RSS feed to receive emails as soon as new posts go up. This entry was posted in Journey Toward Financial Peace, Stewardship and tagged Christmas, Dave, Dave Ramsey, Family (biology), Financial Peace University, Food, January, Woot. Bookmark the permalink.